SAGE | CQ Press publishes the work of leading scholars in groundbreaking textbooks, highly influential journals, and must-have reference materials across the curriculum. Instructors, students, and researchers trust and respect our quality content and cutting-edge resources, which are known for their objectivity, breadth and depth of coverage, and high standards of excellence. Update: Our CQ Press website has a new look! CQPRESS.COM has been updated. Visit the CQ Press website Frequently Asked Questions (FAQ) page and learn more. All the fundamentals. No fluff. Learn more with less! 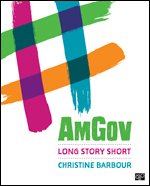 A truly revolutionary American Government textbook, AmGov: Long Story Short, responds to the needs of today’s students and instructors through brevity and accessibility. The succinct ten chapters are separated by tabs that make it easy to skim, flip, revisit, reorient, and return to content quickly. Reading aids like bullets, annotations and arrows walk students through important facts and break up the material in short, engaging bites of information that highlight not only what is important but why it’s important. 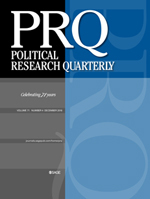 Publishing original research on all aspects of politics, PRQ is among the leading generalist journals in political science. With a reputation for showcasing pluralistic and intellectually innovative research, PRQ engages readers across multiple fields of scholarship. See the table of contents!